It's a burgundy wedding kind of "Color Monday" today. This rustic retreat of a wedding has so many beautiful elements to it--from the mountain lake backdrop to our elegant bride wrapped in a white fur shrug, to all the burgundy pops and rustic and gold elements. It's just gorgeous! Burgundy is a popular wedding color as it bridges the gap between bold and romantic. It pairs perfectly with many neutrals such as: pink, gray, gold, and white. Exquisite for fall and winter, this deep red is one of our very favorites. 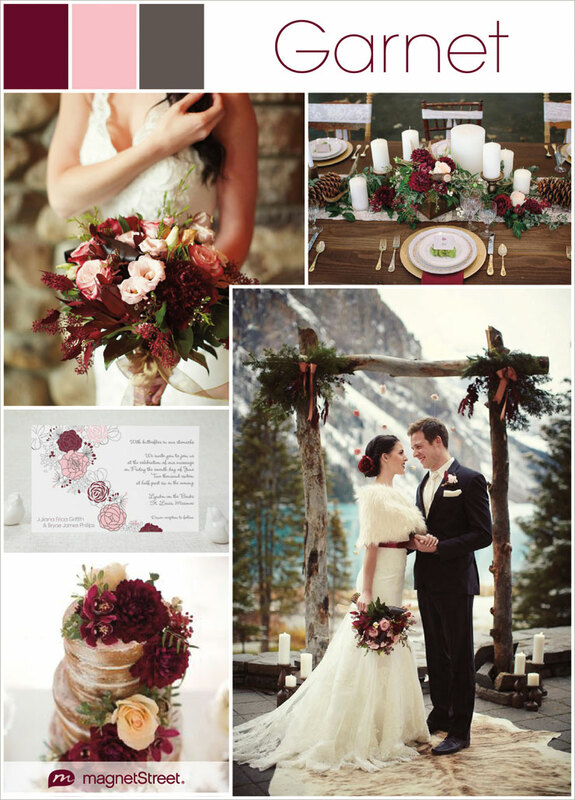 Tell us, what do you think of burgundy as a primary wedding color for fall or winter? This blossomy little Rectangle Wedding design is from of our Botanical Cascade invitation suite. Graphic floral illustrations bring a bit of nature as well as romance to this stationery suite. Also patterning the background are small hearts and flower petals. Get a free sample of this design personalized in your wedding colors. Submitted 3 years 4 months ago by Heidi.